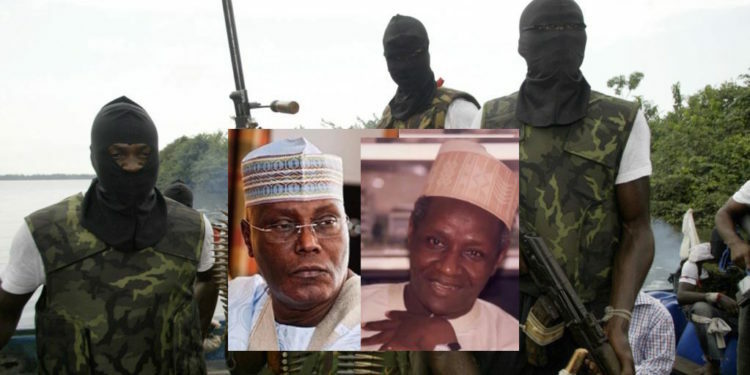 Contender for the Nigerian presidency under the Peoples Democratic party, former Vice president Atiku Abubakar has been involved in massive oil bunkering and even arms running, according to United States sources as revealed in Wikileaks Cables dated 9th January 2009. 1. (U) Summary: Acting Consul General met on December 23 with Tony Uranta (protect throughout), a member of the Niger Delta Technical Committee and campaign manager for the 2007 presidential campaign of Patrick Utomi, Dean of the Lagos Business School. According to Uranta, the Technical Committee’s subcommittee on illegal bunkering identified the late Shehu Yar’Adua as the biggest illegal bunkerer whose interests were inherited by his brothers, and managed by his friend former Vice President Atiku Abubakar with the complicity of the Intels Nigeria Limited oil services company. This large scale bunkering is tied to arms dealing, Uranta said. Most of the kidnapping that has been done in the Niger Delta has not been done by Niger Deltans but by individuals from outside the region. The Technical Committee recommended that the Federal Government grant amnesty to any Niger Deltan who turns in his weapons, leaves the camps and reenters civil society within six months; anyone found with a weapon after that time should be treated as a criminal, Uranta said the Committee recommended. The Technical Committee also called for a fair and open trial for Henry Okah. Uranta’s appointment to the Niger Delta Technical Committee is testimony to his stature as someone knowledgeable about the region and its problems. Independent of the Technical Committee, Uranta has succeeded in pulling together respected people into new groups to advocate for the Niger Delta, and despite his disclaimers, all have achieved some modest success in getting their views into the local press. Whether or not the result of Uranta’s efforts, since the Niger Delta Technical Committee’s report was presented to the President, a steady stream of voices has been heard calling for the President to implement the Technical Committee’s recommendation. It remains to be seen what response the President will make to the report. End Summary. 4. (C) A subcommittee of the Niger Delta Technical Committee looked at the question of illegal bunkering and created its own subcommittee report, which was tendered to the President with the full report. The Technical Committee concluded that militants conduct no more than 15 percent of all illegal bunkering. To come to that conclusion, the Subcommittee members met with former Bayelsa Governor Dipreye Alamaseigha, with major bunkerers who have “fallen out” with powerful interests, and with retired admirals and generals. Uranta claimed that the late Shehu Musa Yar’Adua, the President’s brother, had been the “biggest” bunkerer; when he died, his holdings were taken over by his brothers but managed on their behalf by his close personal friend, former Vice President Atiku Abubakar, through the Intels group. (Note: Intels Nigeria Limited, run by Italian nationals, in 1982 began the development of the Onne Oil and Gas Free Zone’s Federal Ocean Terminal in Rivers State. Atiku Abubakar is contesting in the 2019 presidential elections against another old and wasted cabal, Muhammadu Buhari whose regime has been recognized for stagnation, massive corruption and state-actor-perpetrated mass murders and burials of all dissenting and protesting voices in the nation. There has been clamor for new generation candidates in the upcoming elections, but the momentum has not yet built strong enough to over power the two major political parties, the APC and PDP which many Nigerians say are two sides of the same rotten coin. These major parties are gearing to pump billions in looted money into the elections and in Nigeria, money rules. Massive looting of state funds has continued unfettered under the current National Petroleum leadership and in different departments till date. On the list are several revolutionary candidates who have won the nominations in less popular parties. These include a former Education minister, Oby Ezekwesili, an activist known for his online editorial, Yele Sowore and other vocal candidates like Jaiye Gaskiya and Tope Fasehun.